Luxury Sumatra is a quality accommodation at 30km south of Krui in the West Lampung province of Southern Sumatra. We are 5 hours away from the closest airport in Bandar Lampung. Luxury Sumatra is right in front of the longest and most consistent left hander in the region, “Ujung Bocur”, on the point of Tanjung Setia. 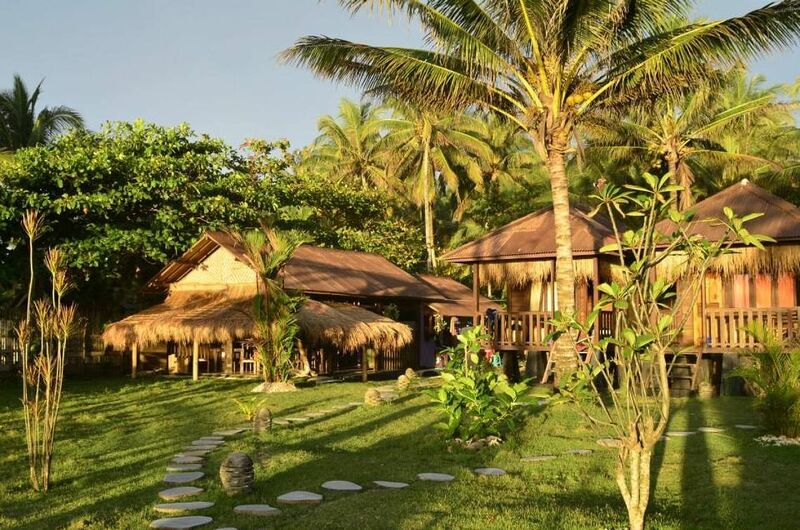 Due to the remoteness and long journeys for transfers, we offer a fixed package of 12 days at the Surf Camp, to fully enjoy the surf and the place. 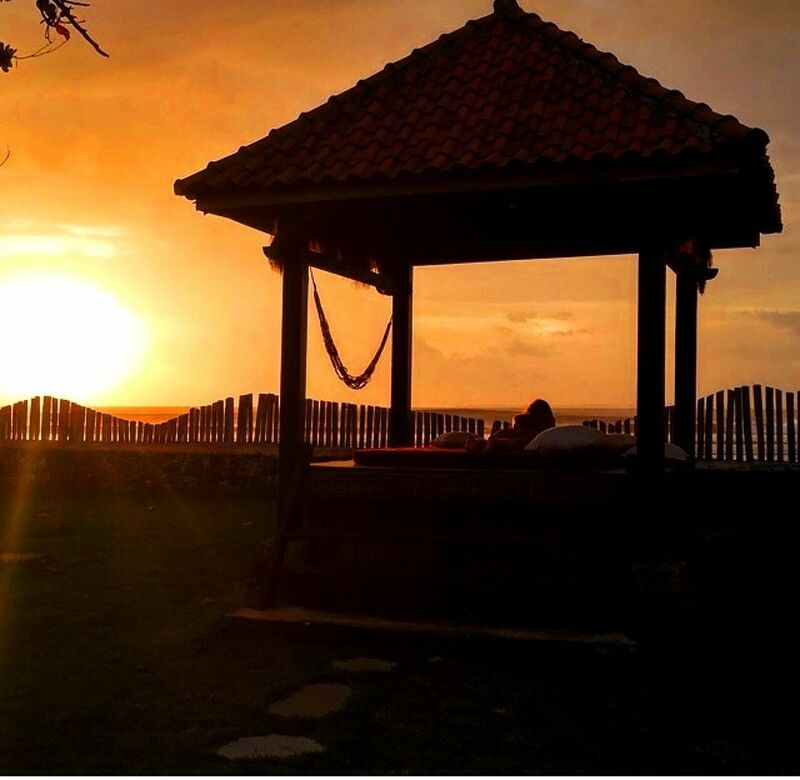 Your comfort and luxury is our first priority at Luxury Sumatra, and we´ll do everything to make your stay a dream vacation. The food is fantastic, the drinks are cold. 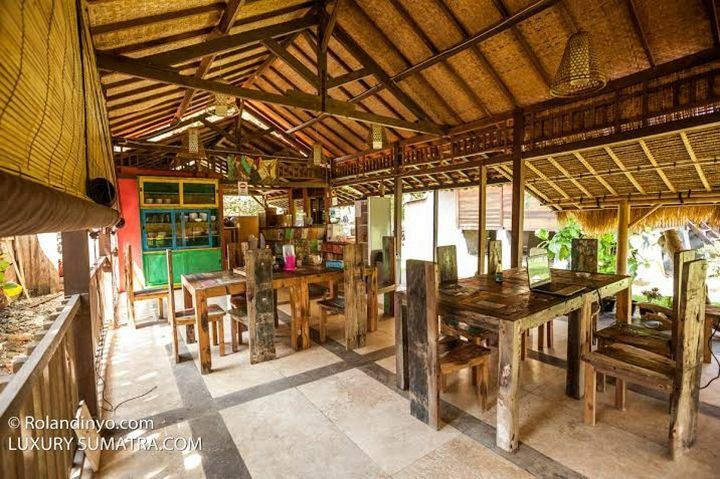 Luxury Sumatra is truly a special place for so many different reasons. We love our little corner of the world, and we hope you´ll come join us for a stay soon ! The best way for getting to Luxury Sumatra is from Jakarta or Bali and taking a domestic flight (Jakarta to Bandar Lampung, flight codes CGK TGK), which can be booked through internet or from your local travel agent. It is also an option taking a bus, ferry or car depending on your time or budget but this options are secondary and not recommended unless you are an adventurer. *The transport for other packs will be an extra charge, contact us for more info. 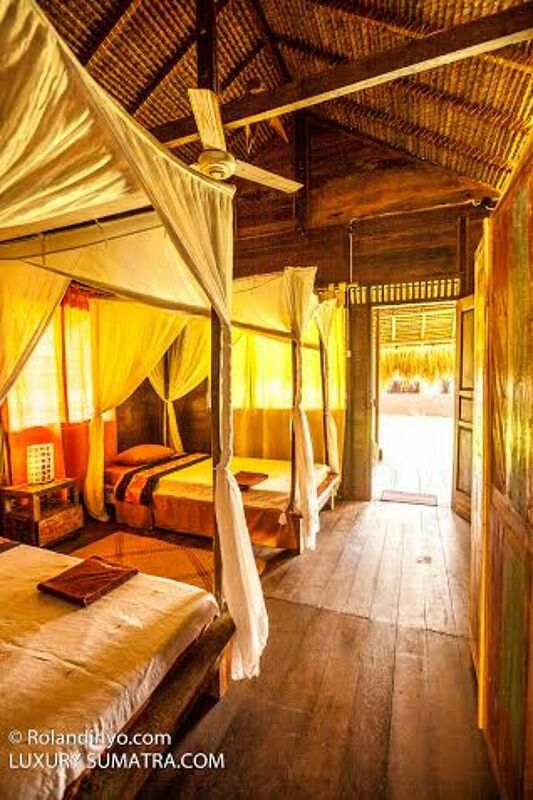 Luxury Sumatra is home to four spacious double cottages. Each bungalow is an entirely separate residence, completely detached on all sides for added privacy and security. Though the amenities very slightly from bungalow, all are clean, new, and extremely well appointed. All our bungalows are constructed of the highest quality materials, including the same local hardwoods you´ll see throughout our resort. We take care of the details and the design to give you the whole comfort. 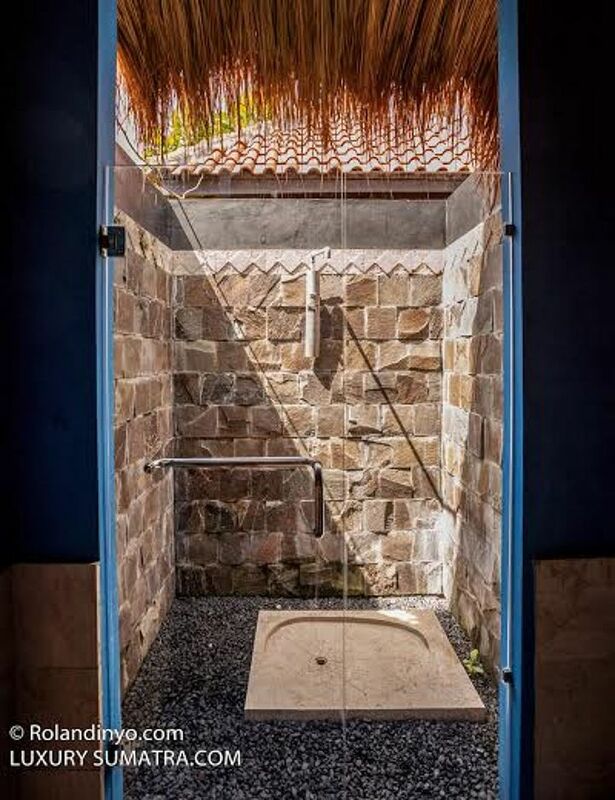 Luxury Sumatra gives our guest complete views of the ocean, resort, and all its surroundings during the day, and allows it to take full advantage of the sea breezes at night. 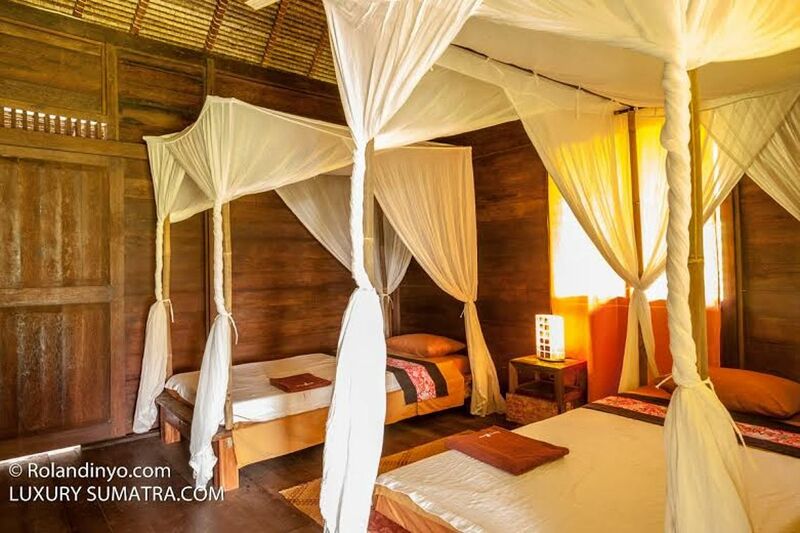 The rooms are very comfortable, equipped with mosquito nets, ceiling fan and closet. 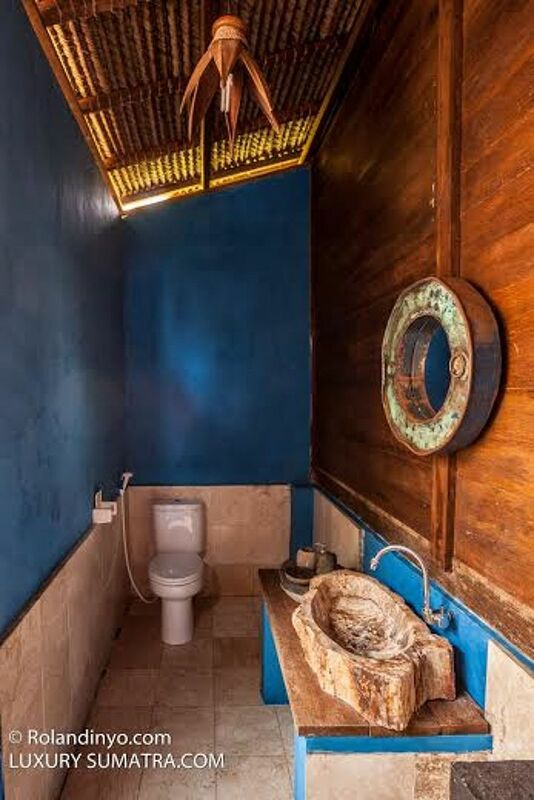 The bathrooms are spacious and care to detail. 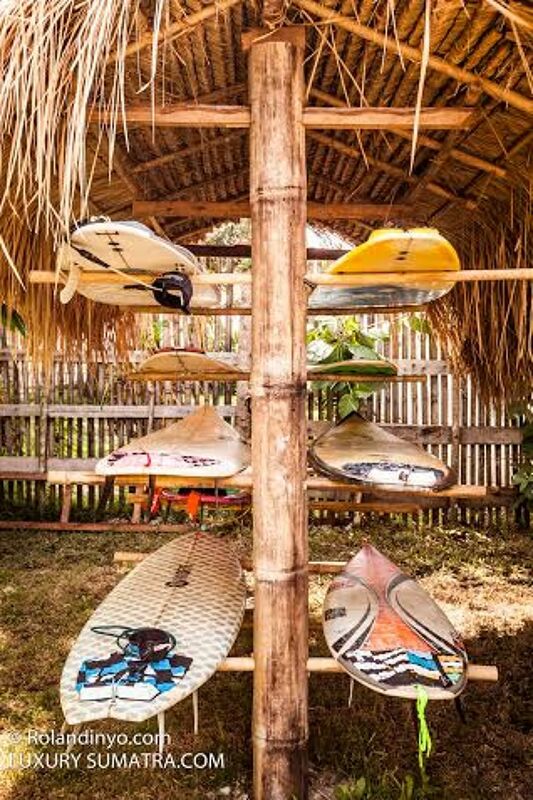 In addition, each bungalow has its own terrace and storage area on the floor of the residence to save your surf boards in the shade. Beautifully constructed from entirely local hardwoods, our gorgeous open air restaurant is a wonderful place to enjoy a meal and reflect on the days activities. The bar design is also great for the social life. The Luxury Lounge also comes complete with couches and chillout areas, a separate bar snack menu, and cold drinks. We´ve also added wifi, games... as well as satellite TV for those who can´t miss their sports, news, etc. 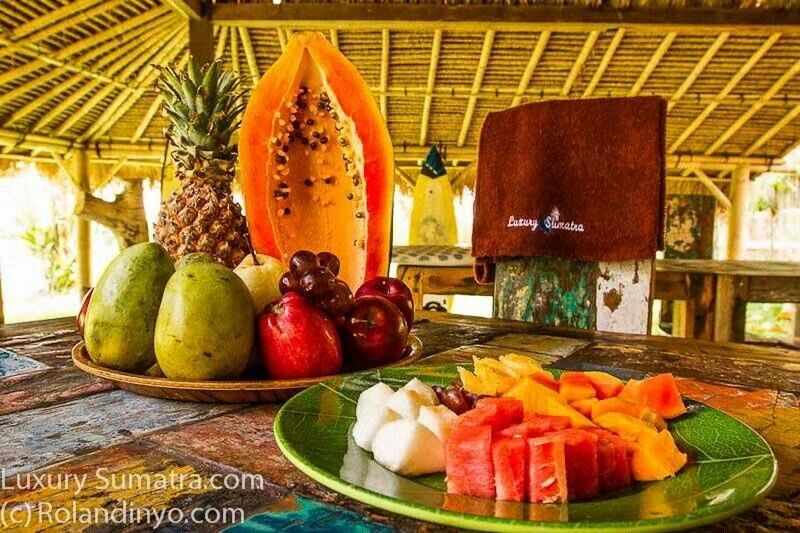 We take care in the preparation of the meals for our guests. All meals are served daily which are designed not just to delight your taste buds, but also replenish and refuel your body. We specialize in a variety of seafood dishes using fresh produce caught in the local waters, but we certainly don´t limit ourselves to fish. You can expect anything from pasta dishes, to hamburger, to steaks, to chicken. And all meals are complemented well with a variety of vegetable, rice, fruit dishes, etc. All high quality, high energy and healthy. The main surf season runs from march till november. This fits in with the trade winds which blow offshore this time of the year. We do occasionally get shifts in wind directions but luckily we have waves around that face the opposite directions, so there is always somewhere offshore nearby. The ” off ” season, november/december till february/march, can still provide periods of offshore conditions and no crowds. For those not fazed by heavy rains and a need to search out waves. The crowd factor will be nearly zero. Just in front of the resort you can enjoy this perfect wave. Karangnymbor is the most constant wave in the area. There are son many different waves within striking distance of Luxury Sumatra that there is something for everyone. Some are right out our backyard, sometimes we´ll make one hour and go to a more distant locations. 9.Airport taxes to leave the country cost 150000 IDR for international flight and 30000IDR for domestic flight. No “A.T.M”. at Karang Nimbor , so bring extra cash. The closest ATM is in Krui (30 minutes from Luxury Sumatra) and the only way to get cash is bringing your Master Card, if you don’t have a Masterd card the closest one is in Lewa (2 hours from Luxury Sumatra). The resort is not responsible for the transport to the bank. Buses are the main transportation mean in Indonesia : they go from the old “ekonomi” ones connecting the suburban areas (taking passengers, mail, goats, pigs…) to the luxuriant buses, through the express buses (“patas”), night buses (“bis malam”) and “the tchuk tchuk” or “bemo”, little smoky tricycle transportation.